Have you ever imagine how your boat will look like and function in Virtual Reality? There is a wide difference between VR and a 360 virtual photos or a hard copy brochures. The amazement of the truly immersive high-quality graphics and interactions in the Virtual Reality world is more than what you are imagining. 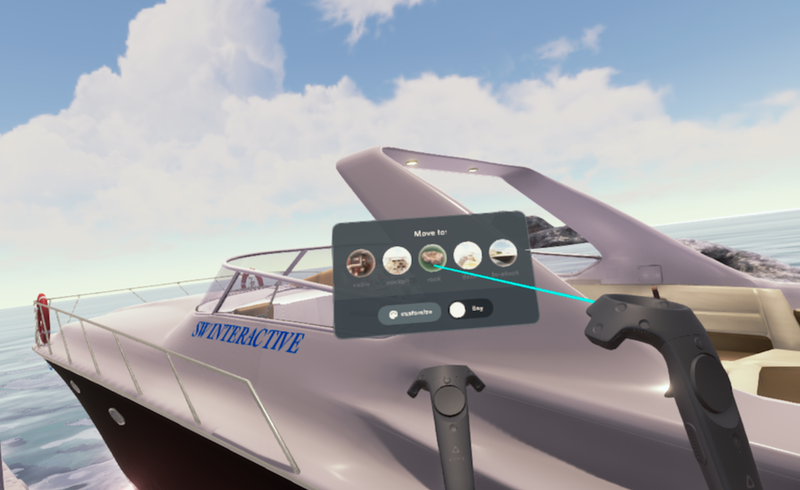 After putting the HTC Vive headset the customer can use the controller to interact with every part of the boat, freedom to roam around, changes from day to night, and even Real-time Customisation (interior and exterior of the boat). Knowing the spacious of the cabin room, the height of the cabinet is a place and every dimensions parts or layout of a real boat are build in the VR and it let you have the real vision on the final outcome. VR technology allows potential buyers to enter into any yacht model in the portfolio that match their personal requirements and purpose of usage such as vacation, destination, events and etc. The experience of giving buyers a sense of ownership and involvement, allowing them to have the flexibility to customise. It displays an image that the yacht builders or designers are a customer-centric. Also, portray a good example that they listen to their client's specifications and match the requirements. Thus, having the ability to adapt different specific models desired to different markets with VR technology. How about a test sea-drive? The headset uses a stereoscopic display, allows you to see a 3-Dimensional and depth of mere realistic image of what you are viewing as it will be packed with more Pixel density in those display and get immersive. Until it plays a trick to the mind, to believe that you are truly presences in the virtual realm with an opportunity of the geographical accessible location, to sea trial your boat in a small island in SouthEast Asia or in Monaco for the weekends. Curious to learn more? Contact us and we will guide you.